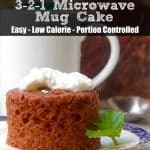 Looking for a low-cal or low-carb option for fajitas? We’ve got you covered! 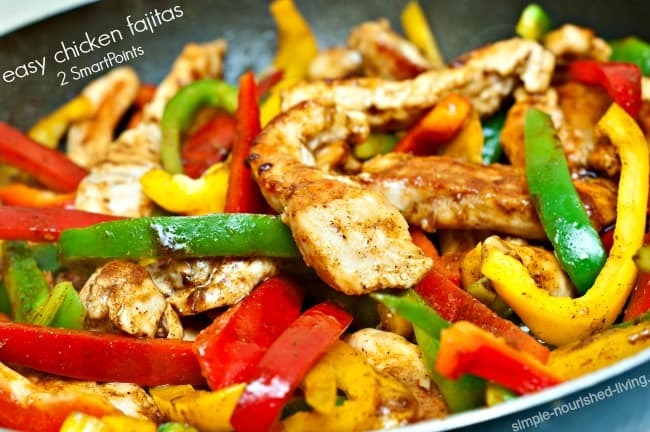 Fajitas are AWESOME, easy to make, and can definitely be made light and healthy. Marinated boneless, skinless chicken breasts, sautéed with red and green bell peppers and onions, served with a variety of accompaniments. These fajitas need to soak in the marinade for at least 30 minutes, so be sure to plan ahead. I love fajitas, so I’m not sure why I don’t make them at home more often. 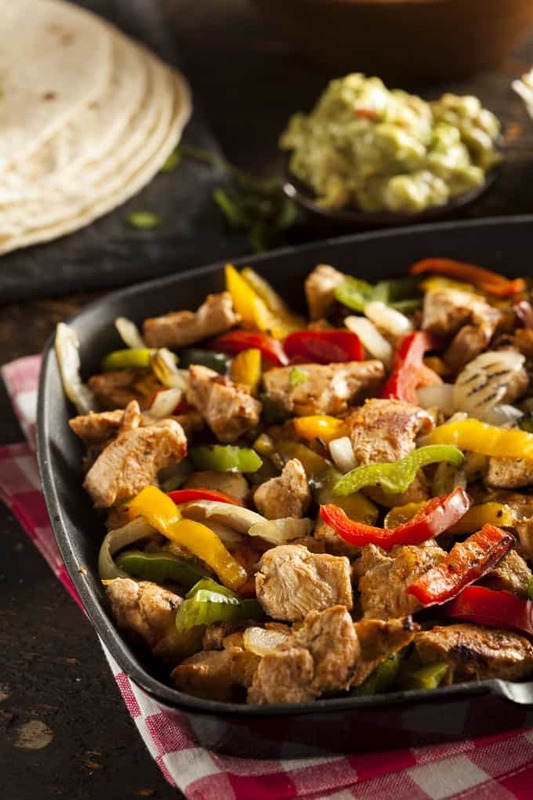 This recipe proves just how easy healthy and delicious homemade fajitas can be. While the recipe for Weight Watchers Steak Fajitas I made a while back is really good, this recipe is even quicker and easier, and calls for boneless, skinless chicken breasts, so it’s lighter too. 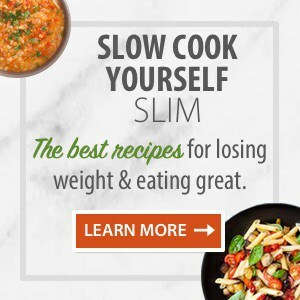 I found the recipe in Eating for Life: Your Guide to Great Health, Fat Loss and Increased Energy (affiliate link), a cookbook I borrowed from the library last week. Wanting plenty of leftovers to use in tortillas, on salads or in burrito bowls for quick-and-easy lunches and hassle-free dinners this week, I doubled the recipe. 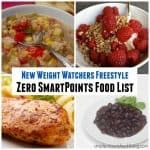 According to my calculations, each serving has 216 calories, *4 Weight Watchers PointsPlus, *2 Weight Watchers SmartPoints, *1 WW Freestyle SmartPoint. 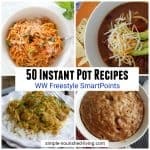 This works with Simply Filling too, provided you eat them without tortillas, or with reduced-fat corn tortillas or lettuce wrap “shells”, which will cost you *0 SmartPoints/PointsPlus. 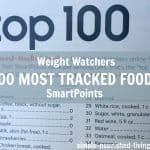 And there are many great low calorie and low carb options for tortillas these days too, which will help keep the points low. Enjoy! Fajitas Salads – toss your fajitas with chopped romaine lettuce, slices of avocado, and sliced grape tomatoes to turn your fajitas into a light, healthy and delicious fajitas salad like this one that came across my Facebook feed recently. Just decrease the oil to keep things SmartPoints friendly…. Fajitas Bowls – Top rice (or cauliflower rice) and/or black beans with your fajitas mixture and your choice of optional additional garnishes to make light and healthy “chicken fajita bowls”. 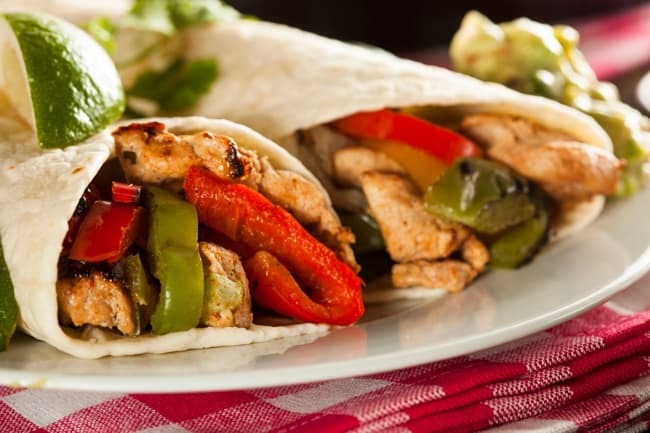 If you’ve made these healthy chicken fajitas, please give the recipe a star rating below and leave a comment letting me know how you liked it. 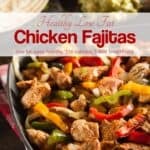 Easy, healthy and delicious, these Weight Watchers friendly chicken fajitas were a big hit when I made them! Lightly coat a large skillet with non-stick spray and place over medium-high heat. Add the chicken and marinade and cook, stirring frequently, until the chicken is no longer pink in the center, 8 - 10 minutes. Transfer the chicken to a large bowl and cover it to keep warm. Lightly coat the same skillet with more cooking spray. Add the onion and cook, stirring occasionally until beginning to soften, about 5 minutes. Add the green and red peppers and cook, stirring occasionally, until tender, about 7 minutes longer. Add the cooked chicken back into the skill and stir to combine and heat through, about 2 more minutes. 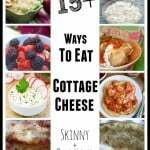 Serve with tortillas, beans, or rice and your favorite garnishes such as salsa, shredded cheese, lime wedges and/or guacamole. A fajita is a term found in Southwest/Tex-Mex cooking which refers to any grilled meat served in a taco or on a flour or corn tortilla. 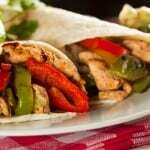 Popular variations of fajitas today include beef, chicken, pork, shrimp and even vegetarian. Popular condiments for serving fajitas include shredded lettuce, sour cream, guacamole, salsa, pico de gallo, cheese, and tomato. Any suggestions for low SP tortillas? Either corn or flour are fine! Hi Jessica, Sorry I don’t. I live in Phoenix where locally made tortillas, both corn and flour are everywhere so I don’t usually buy the national brands. Is it one serving per one fajita? 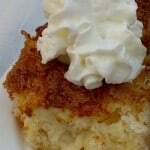 Hi Vern, 1/4 of the recipe is one serving. Hope this helps.